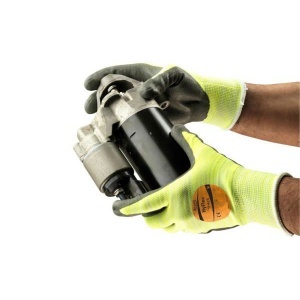 Providing optimal levels of cut resistance, the 13-gauge Ansell HyFlex 11-423 13-Gauge Cut-Resistant Gloves are ideal for providing hand protection for a wide range of industries. They also offer excellent abrasion resistance, and feature a knitwrist cuff for improved wearability. They are available in a range of sizes to ensure the most comfortable fit on either hand. The product code for the pair of gloves is: 11-423. The Ansell HyFlex 11-423 Gloves offer maximum cut resistance, with a level 3 cut resistance rating in accordance with EN 388:2003. They also feature a red indicator button on the back of the gloves to provide instant identification of the level of cut resistance provided. The red colour button indicates cut resistance level 3, while green and red buttons would indicate cut resistance levels 1 and 5 respectively. The table below showcases the test results of the Ansell HyFlex 11-423 gloves according to EN 388 Mechanical Risk specifications. The Ansell HyFlex 11-423 Gloves are available in a choice of sizes, making them suitable for most users. Please consult the table below for details, then select the required size from the drop-down menu at the top of the page. The glove length will range from 220 - 260mm.